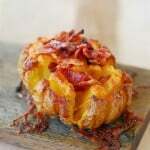 Make this Bloomin’ Baked Potato recipe as a unique side dish or party appetizer. The baked potato skins are crisp and salty, the insides are soft and cheesy. 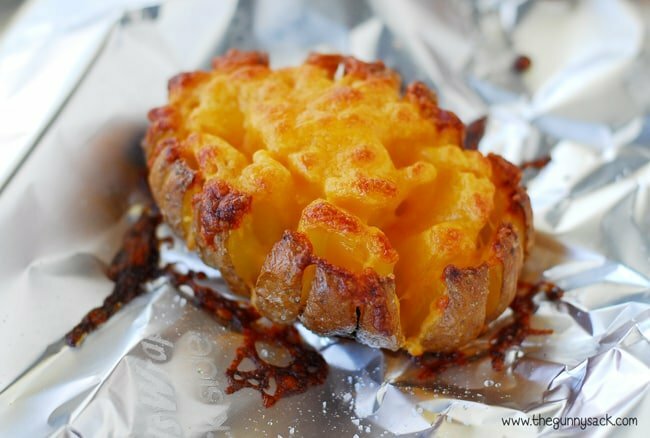 This baked potatoes recipe will make the whole family happy! 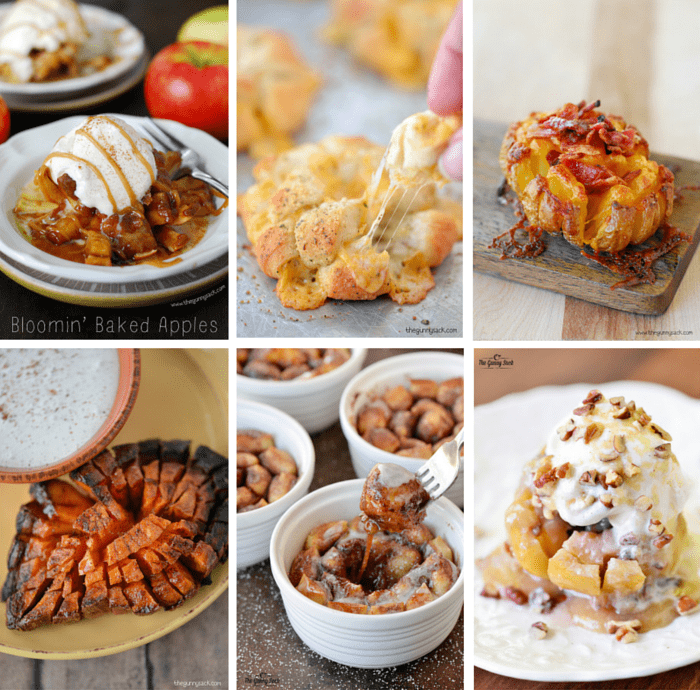 We had so much fun with the Bloomin’ Baked Apples I shared last month that my whole family decided that we needed to make some more bloomin‘ recipes. I’ve seen the fabulous bloomin‘ onion bread recipes online and one of these days I am going to try it but we wanted to go with something else. We tossed around ideas for other things that could be cut in a similar way and we decided on potatoes! Baked potatoes are good anyway, but then when you cut them, cover them with oil and salt and top them with cheese and bacon, you know they have to be delicious! 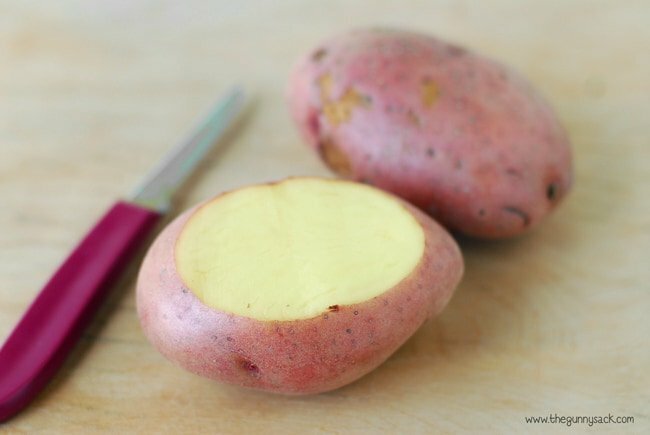 To make bloomin‘ baked potatoes, cut the top off of the potatoes. 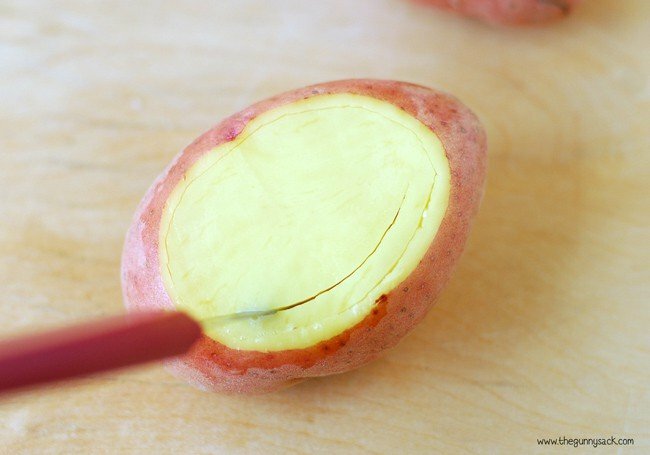 Use a small, thin, flexible knife to cut rings around the inside of the potato. 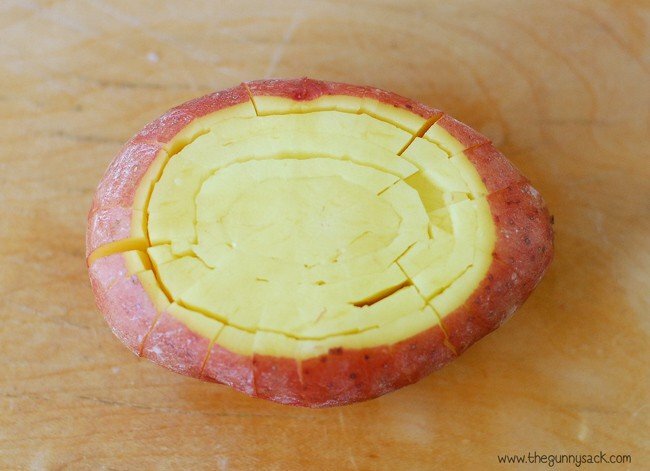 Flip the potato over and make cuts all the way around the potato, leaving a small space at the top uncut. 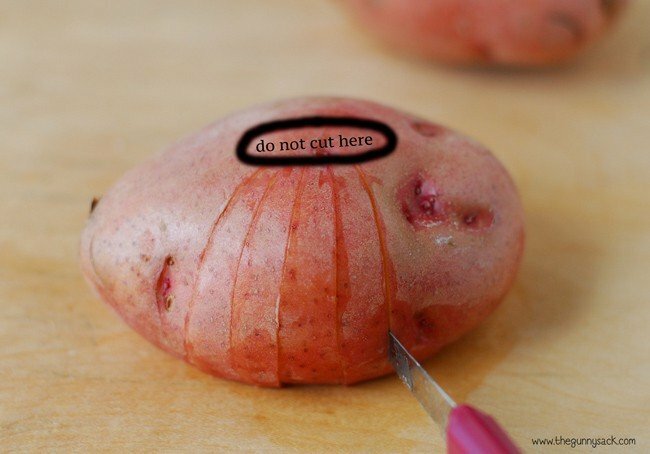 These cuts go all the way through to the center of the potato. Carefully flip the potato back over. If you need to make of the of the cuts deeper, do that now. Cutting the potatoes takes a little patience like making French macarons, dipping gummy bears in chocolate and wrapping bacon around chicken pieces, but the results are so worth it! If you still aren’t sure, try making these slow cooker baked potatoes instead. Brush the whole potato with olive oil and sprinkle with sea salt. 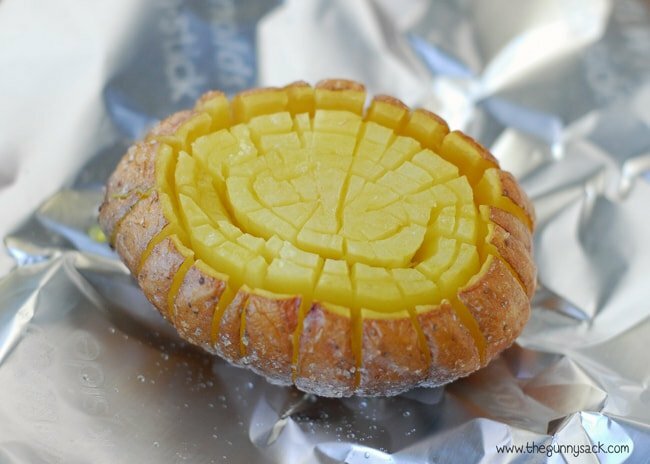 Place the potatoes on foil and bake at 425 degrees. After 30 minutes of baking, brush the tops with additional olive oil and sprinkle with more sea salt. Return to the oven for an additional 30 minutes. This is what my potatoes looked like after baking for 1 hour. Sprinkle shredded cheddar cheese on the potatoes. Return them to the oven and bake for an additional 5 minutes to melt and toast the cheese. Remove them from the oven, carefully transfer them to serving plates and sprinkle each bloomin’ baked potato with crispy bacon bits. Go ahead and add sour cream, onions and whatever else you want and then dig in! 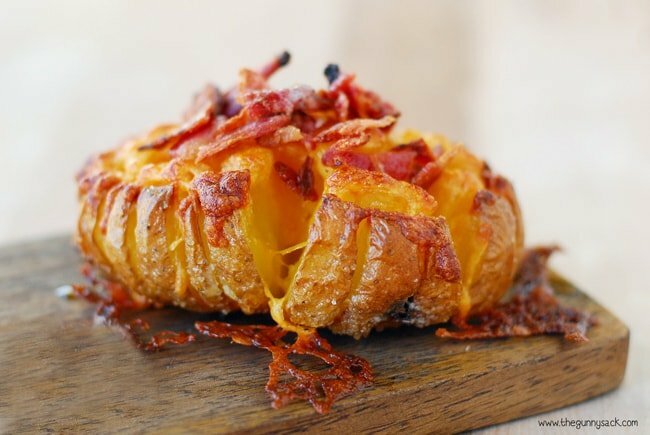 These bloomin‘ baked potatoes were as delicious as they look. My girls were both gone when I made them and they were so disappointed that they missed out. Even Zack, who doesn’t eat baked potatoes, love these ones! The baked potato skins were crisp and salty, the inner layers were soft and cheesy. 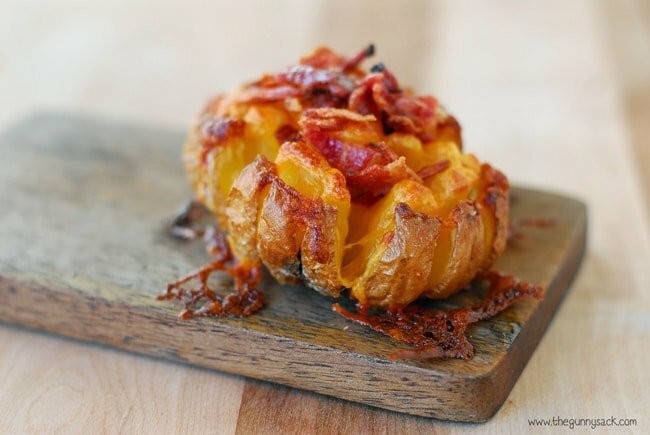 This Bloomin’ Baked Potato recipe would work as an outstanding side dish or as a party appetizer. 1. What kind of potatoes should I use? The best choices for making baked potatoes are russet, Yukon Gold and sweet potatoes. 2. My baked potatoes didn’t bloom like yours. What did I do wrong? Most likely both the circular cuts around the center, as well as the cuts around the outside didn’t go deep enough allowing the baked potato to open. 3. Can these be made on the grill? Yes! I have a separate recipe for a grilled version here. 4. Can these be made ahead of time? Making them ahead of time and reheating before serving will change the texture. But if you want to, bake the potatoes and stop before adding cheese. Unwrap and cool the potatoes immediately. Add the shredded cheese when reheating. 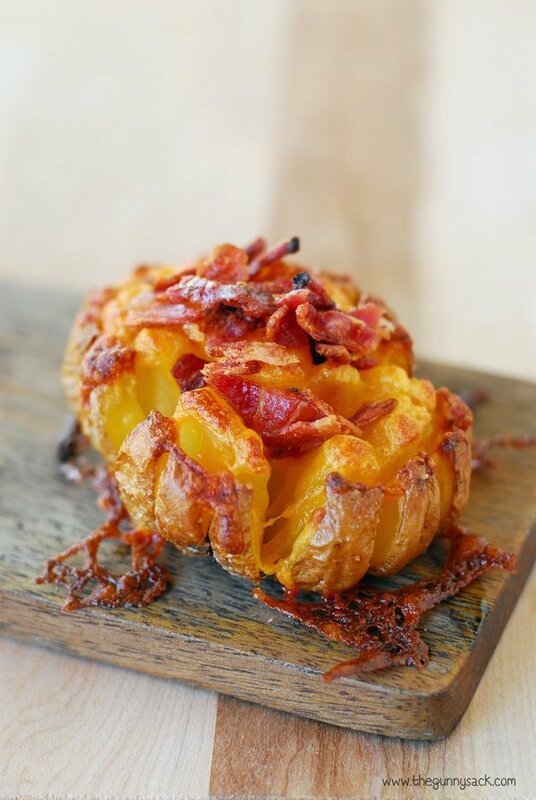 Make this Bloomin' Baked Potato recipe as a unique side dish or party appetizer. The baked potato skins are crisp and salty, the insides are soft and cheesy. Cut the top off of the potatoes. 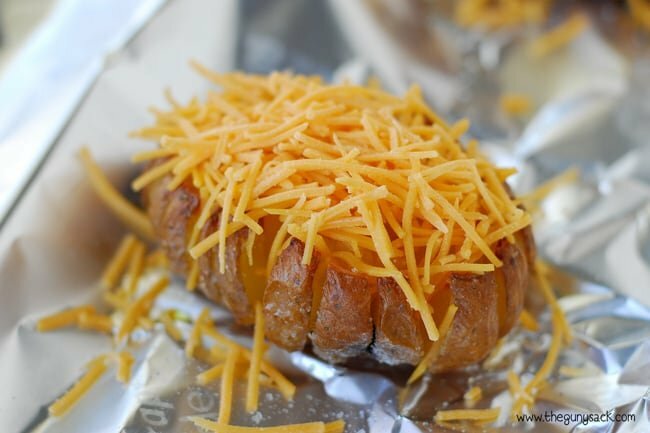 Top potatoes with shredded cheddar cheese. Remove them from the oven, carefully transfer them to serving plates and sprinkle with crispy bacon bits. Have made these numerous times. They are one of my favorite potato dishes! Thanks for the recipe. Just made these for the first time and they turned out delicious! Didn’t think it was hard at all to do the ‘carving’, though I’m sure my next attempt will be visually better. Will definitely continue to make these. These look amazing! I don’t really like onion on it’s own, so liked the concept of the bloomin’ onion, but not the taste. Now I can have best of both worlds. 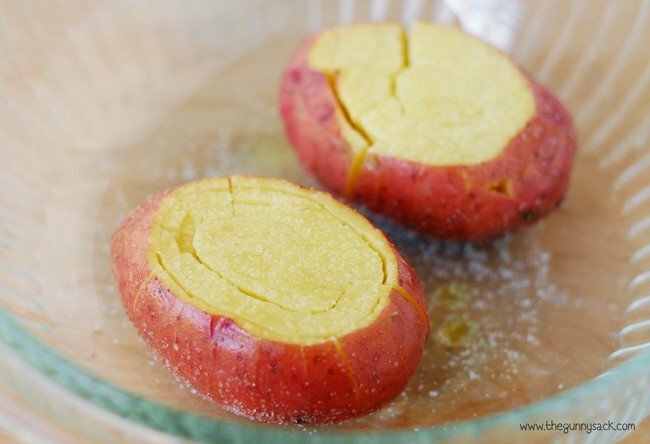 I also like to stuff mine with eggs and have a breakfast potato like this one – https://www.recipestroupe.com/recipe-baked-potato-egg-bowls-51023.html. Do you have any other fancy potato ideas? This way to slice the potatoes is a pain. 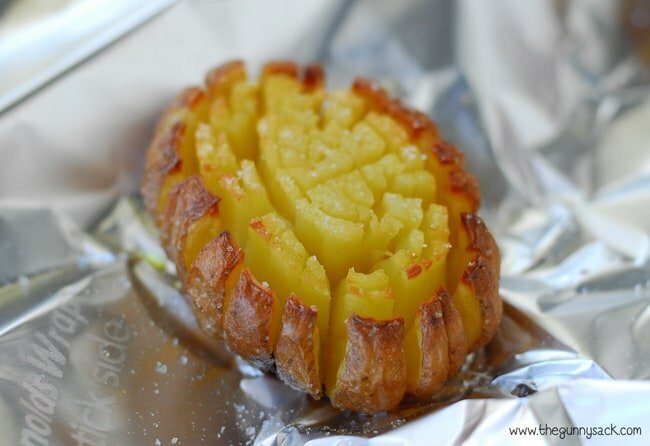 Recommend making Hasselback potatoes with the condiments used in the recipe above. Much quicker to cut, and the same effect of extra crispness. You neglected to inform your readers to remove the “eyes” of the potato. You are poisoning the person you are preparing a potato for. Please include a step to remove the eyes. Please feel free to prepare your potatoes in whatever manner is best for you and your family. Thank you for sharing. I really want to make the potatoes but my dilema is…i only i have 1 oven and im making prime rib…would the potatos hold up if i baked them prior to the prime rib, then placed them back in the oven with toppings while carving the prime rib? Or what would you suggest? Yes, that is how I would do it. Or you can put them on a lower rack in the oven. These were so delicious! 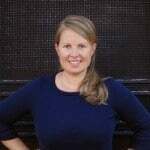 My kids all loved them, and requested to have them more often! I wouldn’t change a thing about them, thanks so much for the great recipe! Are you wrapping it in tin foil when your done? If not do so if it is a little undercooked it will continue to cook a bit in the tinfoil. Just stumbled across this and suddenly I want a potato. This is a genius idea. Pinned!! We made these tonight. They were really good but didn’t “bloom”. Do you have any suggestions?